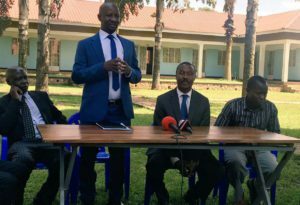 FDC spokesperson Ssemujju Ibrahim Nganda address journalists during the press conference in Luweero yesterday as Maj. Gen Mugisha Muntu (2nd right) looks on. PML photo. KAMPALA–As Parliament prepares to discuss the contentious Presidential age limit today, Forum for Democratic Change (FDC) presidential candidate Gen Mugisha Muntu has been forced to suspend his campaigns and direct his efforts towards fighting the age limit removal. Muntu announced the suspension, saying as a military man, he has to mobilize all those yearning for change to put pressure on Parliament to abandon the project of amending Article 102(b) of the Constitution. FDC will go to the polls on November 24 to elect the party president. Three other party members are fighting to up root Muntu. They include Patrick Amuriat, Moses Byamugisha and Kawempe South MP Mubarak Muyangwa. Muntu’s rivals have however continued with the campaign. Muntu blamed Museveni and the Police for besieging FDC offices, NGOs and arresting politicians and Makerere University students. “It’s absurd that the same government which has been calling for debate on the age limit is now using excessive forces, illegal means to stop Ugandans from talking about,” Muntu wondered. Sources within his camp revealed that Muntu will today appear at Parliament as MPs will be debating the matter. Muntu, a bush war hero served as commander of the UPDF for nine years. The public has in the past wondered why Gen Muntu is never arrested by police and other military agents whenever the opposition stages demonstrations. During the heat of the Walk to Work protests that followed the 2011 general election, Muntu was captured on video being saluted by a police officer as other opposition politicians were being arrested and bundled onto police trucks. The public is yet to see whether the decorated general will be accorded similar treatment. His fellow party boss, Nobert Mao, the DP president, was arrested on Thursday last week while Dr Kizza Besigye was detained at his home in Kansangati. At the press conference he held in Luweero town yesterday, Muntu warned the army against getting involved in partisan politics. Muntu gave a similar message to the late Gen. Aronda Nyakairima, comparing him to a house fly that followed the dead body up to the grave. The former army commander also asked Ugandans to rise up and defend their future. Flanked by Ibrahim Semujju Nganda, the Kira Municipality legislator, Muntu also said power belongs to the people but not to the government or military. “Gen Museveni and the police may close our offices but he cannot close our openness to change or people moving towards a post Museveni,” he said.